Teena and I have missed the past couple of years of the Doors Open weekend in Toronto. The 17th annual Doors Open Toronto presented by Great Gulf returns on Saturday, May 28 and Sunday, May 29, 2016, offering free and rare access to more than 130 architecturally, historically, culturally and socially significant buildings across the city. The Doors Open Toronto 2016 theme of Re-used, Re-visited and Revised will explore the adaptive re-use of buildings throughout Toronto's architectural history. Today we corrected that by going on a free walking tour led by Richard Fiennes-Clinton of Muddy York Walking Tours. We have gone on many tours with Richard, who always leads an interesting and informative walk. Today's walk was on Industry and Internment in Liberty Village. We met across at Hanna and Liberty St, across from the old Brunswick building. Here are Richard's volunteers who assisted with the walk. Our first stop was by Lamport Stadium. It was an extremely hot day and Richard found the shady spots to stop for a talk. I never knew but Lamport Stadium was built on the site of Mercer Reformatory for Woman, the very first women's only prison in Canada. 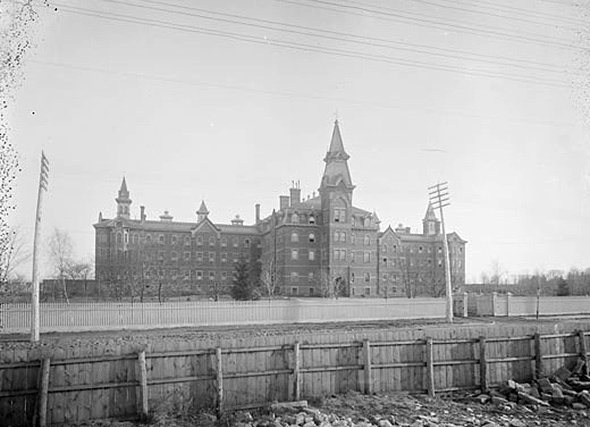 Built in 1872, it was finally shut down in the 1960s due to mistreatment of the inmates and the inhumane conditions that they were forced to live in. The Liberty Market was our next stop. It was a rail stop for the unloading and storage of parts and equipment. The east side of the original building (to the right), and the maze of condos in behind. Next up was the last existing building from the men's prison, that stood on the Liberty grounds, the prison chapel which was built in 1877. Richard told us the history of the prison and how the chapel was used for storage by Inglis, while they had their factories on the site. You can still tell it was part of a jail. The west side of the chapel. You can still kind of see the Inglis sign over the door to the left. The west side of the chapel. A view of Toronto as we came up over a hill on Liberty near Strachan. Our final stop was at the Massey-Harris offices. I've always been pleased that although turned into condos, the outside was kept in its original form. Richard told us of the history of the Massey family and business. I never knew that Raymond Massey, a famous actor from the forties and fifties, was the son of the wealthy Massey family. The Massey Harris symbol, which sits on top of the plaque to the right of Richard, dedicated to those Massey employees who lost their life fighting in the first world war. The creative Massey Harris molding on top of the north side. Looking closely at the west side, you can see two extensions were added to the original offices. The Massey Harris building sits in nicely with the newer buildings of today. It was an enjoyable and informative walk, as Richard's walks always are and I learned a little more of the neighborhood where Teena and I live.